Hornbill Service Manager is a software-as- a-service (SaaS) IT service management (ITSM) solution that's the product of Hornbill's twenty-plus years in the ITSM tools space and the realization that service management is ultimately about people and how well they're able to work together. Thus, in ITSM.tools' opinion, Hornbill Service Manager is not your average ITSM tool. Instead it's an ITSM application built on the Hornbill Collaboration Platform, and those experiencing the solution will see the differences; along with unique customer-engagement practices such as a 30-Day Satisfaction Guarantee, free expert services, and no contractual tie-in. The offering is continuously deployed, and as such, always up-to- date, with all customers on the latest release. In our opinion, Hornbill's collaborative approach benefits customers on a number of levels including delivering a modern, consumer-like way of working and the means for company-wide enterprise service management (ESM) adoption – the digital transformation of corporate back-office operations. The focus on collaboration over old-school ITSM; a collaborative approach to knowledge management; the use of continuous deployment; and unique customer engagement practices such as "try before you buy" with free expert services rather than just offering a free trial. Short term, Hornbill's focus is on the automation of IT operations to support DevOps initiatives, and continued development of ESM capabilities. Longer term Hornbill is planning to extend its portfolio outside of internal support, into the external customer service space, with new CRM, workforce management, and productivity applications. Hornbill believes that great businesses succeed by sharing knowledge and experience in an open and collaborative way. Thus, rather than being a standalone ITSM solution, Hornbill Service Manager is built on the Hornbill Collaboration Platform – overlaying proven ITSM best-practice principles on collaboration technologies. Hornbill states that the solution is designed to be as simple to use as consumer-world applications, with the ITSM best practice and ease of use underpinned by collaboration and process automation capabilities. In ITSM.tools' opinion, Hornbill has differentiated Service Manager within the crowded ITSM tool market by understanding that improving how people work together is now potentially more important than rigidly replicating best-practice espoused processes using technology. Self-Service – the Service Manager portal is intuitive and highly configurable, providing a consumer-like experience for end users and/or external customers. Service Catalog – this allows customer organizations to define services across different internal service providers and thus caters for ESM scenarios. Knowledge Management – as well as traditional knowledge articles, Service Manager captures knowledge from conversations, with these processed (for use) via collaboration. Hornbill CMDB – the integrated configuration management database (CMDB) underpins the service catalog and supports the incident, problem, and change management processes. Hornbill Service Manager is not PinkVERIFY certified. Not because it doesn't meet the criteria, but because Hornbill sees little customer value in the time, effort, and expense of the certification process and outcome. In ITSM.tools' opinion, this is a good thing, and is another example of Hornbill refusing to blindly follow ITSM industry norms. Hornbill states that the solution supports 187 languages, using Google's translation service for real-time translation capabilities. This allows IT users to work in their local language while still communicating and collaborating with IT and end users in other languages. 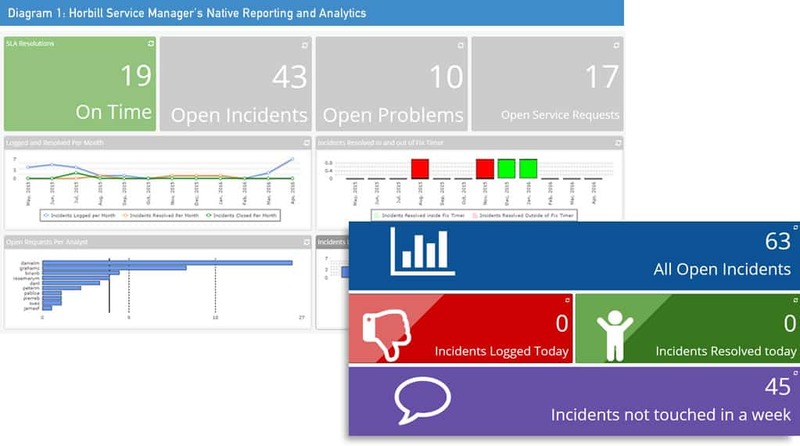 Hornbill Service Manager's reporting and analytics capabilities allow customers to create reports using measures, widgets, and scorecards with the native report designer offering the expected filtering, sorting, and publishing capabilities. The user-definable widgets form the building-blocks of role-based dashboards, and Hornbill Service Manager’s dashboard designer allows them to be added or moved using drag-and-drop. Plus, the Hornbill Service Manager trending engine allows users to look at performance against targets over time. IT asset management – assets (hardware and software) and configuration items can be recorded and managed (throughout the asset lifecycle) using the integrated Hornbill CMDB. Document management – in addition to knowledge management, Hornbill Service Manager also includes a document manager application, with full version control, to support collaboration and the wider sharing of knowledge. Timesheet management – users are able to record the time spent completing their activities (across the different categories), and management can see how people resources are consumed. Project management – with collaborative workspaces, task boards, and calendars to underpin project management activity. The Collaboration Platform and the applications running on it, such as Hornbill Service Manager, are subject to continuous delivery and continuous integration software development methodologies to incrementally deliver new features and other updates quickly and with no disruption to customers. The Hornbill Collaboration Platform is designed to provide enterprise-grade data isolation – each customer "instance," and the data associated with it, along with the application services that support the data are fully isolated from each other. Hornbill states that this is achieved at various levels using approaches such as machine virtualization/sandboxing and independent data stores, databases, and caches. Diagram 2 shows a layer-based view of the solution. Customers can access their Hornbill instance through any supported web browser and, importantly, this is for both user and administrative functions. Access from mobile or tablet devices is via browser-native apps, available for both Android and iOS via the respective app stores. Hornbill is very transparent about availability. And while Hornbill's standard terms of service contractually commit to a minimum of 99.5% availability, the company measures itself against an operational target of 99.95%. It also openly displays live service availability and performance metrics at https://trust.hornbill.net/system-status. 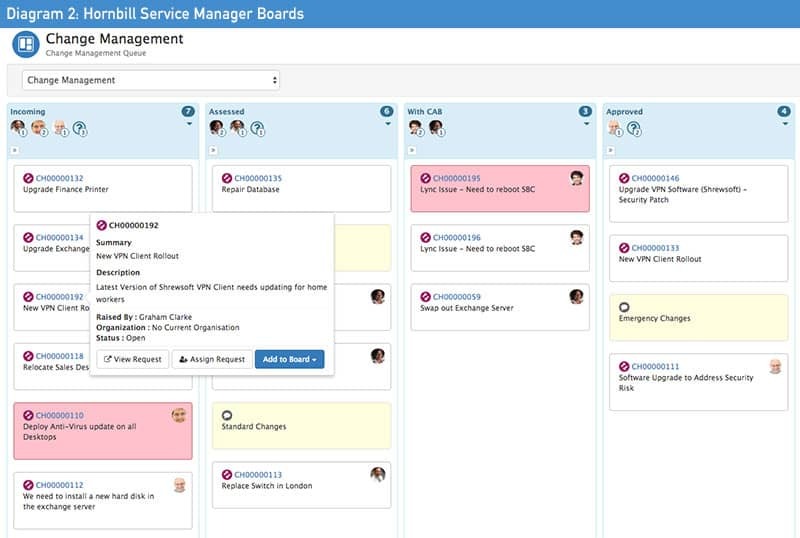 In ITSM.tools' opinion, Hornbill's focus on service transparency along with customer-related innovations such as "Priced for Life," "Trained for Life," no contract tie-in, 30-Day Satisfaction Guarantee, and free implementation, elevates it as one of the most customer-centric ITSM tool vendors. Hornbill states that Service Manager instances are security hardened at three levels, with all changes to instances logged through a formal change request process and access to all systems audited and reviewed on a regular basis. In addition to controls around process and technology, there are vetting controls around the people that work within the Hornbill Cloud team. In October 2015, Hornbill gained ISO 27001:2013 certification for its cloud operation. Hornbill has also commissioned an external consultancy to perform additional independent audits to ensure that processes are followed, and improved, in line with ISO 27001 requirements. Hornbill Service Manager instances run on fully redundant infrastructure and instances are continuously replicated to backup servers in the primary data center, and to backup servers in a secondary data center. Backup replication is near real-time, so secondary data backups are rarely more than a few seconds behind the primary data set. Snapshots of each instance's data are taken on a daily, weekly, and monthly basis without any service downtime, and are cycled, to ensure that a full daily, weekly, and monthly backup is always available. Backup snapshots are encrypted and stored separately to maintain high data redundancy. In the event of a disaster, requiring a full restore, data can be recovered from two sources: the daily backup, and the backup server containing the latest snapshot of the system, prior to the disaster event. Depending on the size of the instance, Hornbill states that an emergency restore takes between 1-2 hours to complete. In addition, its restore procedures are fully tested every three months. In terms of scalability, the Hornbill Collaboration Platform was designed to accommodate enterprise-scale needs. It scales horizontally though the addition of extra hypervisors and rack space. Hornbill can also quickly create an instance or a complete replica of the Hornbill infrastructure in Amazon Web Services (AWS), which means that capacity and scalability is never an issue. According to Hornbill, its largest Service Manager customer has 368 subscribed users. Hornbill's Continuous Delivery methodology pushes new features, improvements, and fixes to customers around 4-5 times per month. Recent updates include Hornbill Live Chat and a new Timesheet Manager application that allows users to record their time across different categories of work. New features and functionality are added incrementally without any disruption to service and customers are always on the latest version of the software. Hornbill states that these updates, rather than upgrades, take between 20-30 seconds and that the Hornbill platform, and its development methodology, guarantees that all customizations will continue to work after every version update. Hornbill states that it operates a "simple, fair, and transparent pricing policy." All pricing information is publicly available at https://www.hornbill.com. Subscriptions are required for all users who are involved in the "provision of service," for instance analysts or managers who action or manage tickets; and end users (the "recipients of service") do not require a Service Manager subscription. Hornbill Service Manager subscriptions start at GB£42.50 per user per month, with a minimum subscription of ten users, and with volume discounts available. The price plan signed up to is then fixed for as long the customer subscribes to the service. The subscriptions are payable annually in advance, however it should be noted that there's no contract term or tie-in. As such, customers are free to terminate at any time, without serving any notice, with any used subscriptions refunded. In ITSM.tools' opinion, this contractual freedom is another key market differentiator for Hornbill Service Manager. Hornbill also offers free implementation, so the majority of customers don't incur any upfront professional services costs. Hornbill has a unique approach (at least in our opinion in the ITSM space) to tool deployment. Firstly, there's a variant of the common no-obligation, 30-day free trial – what it calls a "30-Day Satisfaction Guarantee," i.e. customers can start using Hornbill Service Manager "for real" before committing to a purchase. Secondly, its "Free Switch-On" service provides free expert services during this time to import the customer's data, design their processes within Hornbill Service Manager, and deliver key integrations. Hornbill states that, using these, customers can easily achieve a working solution within 30 days without expensive consultancy. Although it's noted that some customers might require additional expert services to help define and plan the implementation or to assist in the delivery of complex requirements or integrations. In such cases, expert services are typically needed for just a few days and rarely extend beyond two weeks. In terms of training, during the Free Switch-On, Hornbill product specialists conduct remote sessions to build and configure the solution. These sessions are also recorded such that the customer has perpetual access to the knowledge that was transferred throughout the implementation process. Then Hornbill's Trained for Life guarantee ensures that any new customer "champion" receives the same level of training provided to previous "champions" during the Free Switch-On. In-app training is also provided to ensure that users are educated on the new features as they are introduced. Webhooks – a webhook is a call from Hornbill to any web endpoint to trigger an action-specific event when an action is performed. Webcalls – a webcall is a feature of business process management (BPM) tools that allows workflow to call out to other systems, enabling a range of integration possibilities and the orchestration of IT system automation. Hornbill has pre-made integrations for common enterprise use cases, for instance directory services (LDAP), single-sign-on (SAML 2.0), and email (Exchange, Gmail, and others). It also operates an open-source community model for integrations with other systems and migration tools, with integrations actively developed and maintained by Hornbill but delivered in open source under the Hornbill Community License (HCL). Essential Success Plan (FREE) – this is included in every subscription and offers 24x7 assistance, via online reporting, for critical service availability issues. Up to three named contacts can access the Hornbill Community Forum and make use of knowledge resources, open-source integration tools, and APIs. Premier Success Plan (GB£250.00 per month) – this is everything in Essential plus five named contacts get access to Hornbill's Customer Support Teams for application support for non-critical issues. It includes multi-instance support, defined service levels and ten credits for Expert Services. A dedicated customer success team provides quarterly service delivery reviews and priority incident reports. Concierge Success Plan (GB£2,500.00 per month) – this includes everything in Premier and provides ten named contacts with access to a Technical Account Manager, dedicated product specialist, weekly service delivery reviews, and development escalation priority. It includes 100 credits of Expert Services and preferential rates on further expert services. Hornbill Service Manager is targeted at upper mid-market and enterprise-level companies across all industry verticals. Service Manager is a relatively new offering and as such Hornbill has so far focused on EMEA with the North American launch planned for Q2 2017 and a partner model used for rest-of-the-world sales. To date, Hornbill states that it has seen significant traction with public sector organizations tasked with improving services, including extending digital services, while reducing costs. These organizations find the free implementation, no contract lock-in, and priced for life approaches well suited to their operational environments. Furthermore, Hornbill says that its customers are also increasingly using Service Manager to improve service and reduce costs outside of IT, i.e. to support enterprise service management across other lines of business such as HR and facilities. In ITSM.tools' opinion, Hornbill's collaborative approach to ITSM is well suited to organizations looking to exploit ITSM technology for enterprise service management or the digital transformation of back office operations. Hornbill's business and marketing strategies are very much based on customer success and trust, and ITSM.tools believes that from the outset – with its 30-Day Satisfaction Guarantee, the Free Switch-On service, and free training – Hornbill is creating a dynamic that not only reduces customer risk but is also an initial investment in a long-term partnership. Hornbill Service Manager is a relatively new service offering and, as such, the majority of revenue is currently generated through a direct model. Hornbill recently signed Manag-E as a strategic partner in the Nordics, and states that its Service Manager partner strategy will be extended to other regions during Q2 2017. North America – Bittercreek Technology Inc.
Hornbill has already acquired circa 100 customers for its new Service Manager offering and states that, during 2016, it has maintained a 100% retention rate on what is effectively a month-to-month service. In terms of customer satisfaction, the current net promoter score (NPS) for Hornbill Service Manager – albeit for a relatively small sample size – is 94, based on NPS ratings taken at the end of each Free Switch-On and for every support request. Hornbill has a taken a different route to solving the challenges of corporate IT service delivery and support. 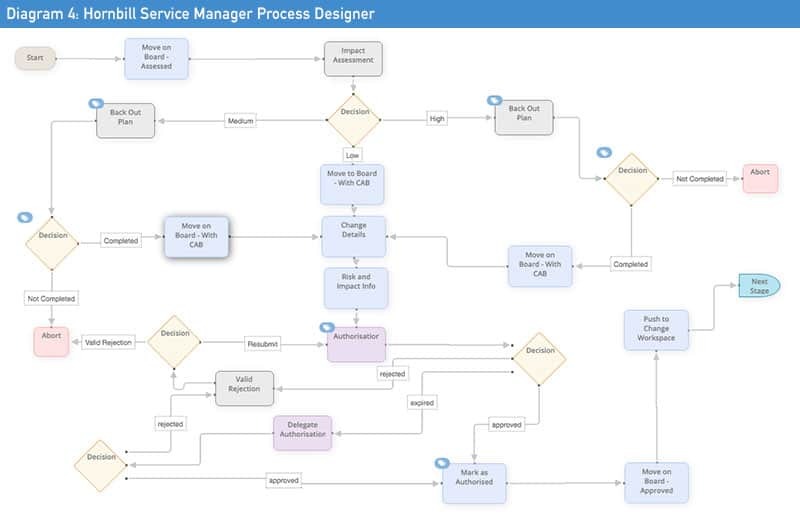 As a result, we believe Hornbill Service Manager to be unique in the ITSM tools market – offering a collaborative platform and capabilities that can be leveraged to support an ITSM application rather than an ITSM application with embedded collaboration capabilities. However, customer processes are still enabled through the ITSM tool staples of workflow and automation, knowledge management, and management insight. In ITSM.tools' opinion, Hornbill's ITSM history and the offering's breadth and depth of capabilities make Hornbill Service Manager well suited to its target market of upper-midmarket and enterprise organizations. The collaborative approach in particular also makes the ITSM offering highly applicable to other lines of business through enterprise service management. Finally, the 30-Day Satisfaction Guarantee and free expert services provide a low-risk opportunity for organizations to assess the solution using very relevant use-case scenarios. Hornbill is a privately-owned company set up in 1995 by CEO and Founder Gerry Sweeney. Gerry passionately believed that the then help desk tool market needed a step change to better support market needs. Over twenty years later, the company prides itself on its mission to "help people at work communicate and share information across business, geographical, and cultural boundaries while simplifying the process of getting work done." "IT professional training is broken." And one of the reasons we have this situation is our approach to “scoping and evaluating" training. In this article we take a look at why. Given the rate of updates due to Hornbill’s continuous delivery-strategy, this article already needs an update. The new operations automation and integrations, as well as the new data driven Knowledge Management are just two of the new features worth mentioning.